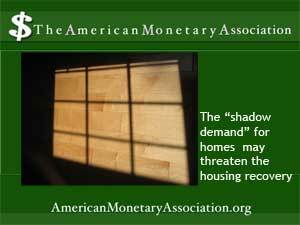 New Shadows Threaten the Housing Recovery? The shadow inventory is the term given to the backlog of foreclosed homes that haven’t been put on the market – held back until conditions improve, or because of the much-publicized issues related to the processing of foreclosures by lenders guilty of fraudulent practices. These homes are waiting in the wings, so to speak, potentially capable of flooding the housing market all at once and driving prices down. the theory goes, large numbers of these would-be buyers are regaining enough stability to revisit home buying. As mortgage rates continue low and the number of homes for sale is limited in many markets, these buyers may be experiencing the sense of buyer urgency that could spike demand for new and existing homes – a belief that now is the time to buy before conditions worsen, rates go up and they lose their financial footing again. Also fueling the shadow demand are the so-called “strategic defaulters” and other victims of foreclosure. These former homeowners are trying again to buy homes, now that waiting periods imposed by mortgage lenders are running down and lenders are taking a second look at credit problems caused by the housing collapse. What does all this mean for the housing recovery – and for investors seeking to buy income properties? Industry experts fear that, like the shadow inventory, the shadow demand will suddenly emerge into the light, with a sudden, large influx of new buyers competing for the limited number of properties available for purchase. That could cause prices to rise, with an added benefit of helping some shrugging homeowners dealing with negative equity to regain some stability. Pressure could also increase on sellers to close deals quickly, and on banks to push more homes onto the market to meet the increased demand.